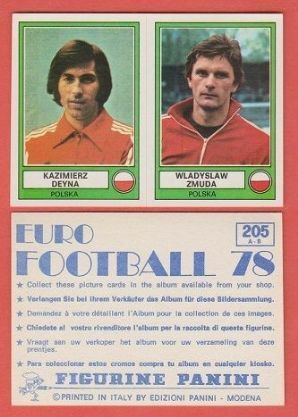 Foreign Football card issued by Panini under the Euro Football 78 series. Measures approximately 6 x 8.5cm. Depicting the Poland stars Kazimierz Deyna who played for Manchester City and Legia Warsaw and Wladyslaw Zmuda who played for Slask Wroclaw, Widzew Lodz, Verona, Cremonense and New York Cosmos.